For a long time I was on the hunt for the planner that would solve all of my problems. Sadly, the planner that actually does all of the things for you doesn’t exist. That would be glorious wouldn’t it?! Nevertheless, there are some excellent options out there. Since everyone works a little differently, it’s good to check out all of the options and then select the planner that works best for your needs. Before you go looking for that perfect planner, take some time to decide what all you want out of your organizational device. Ask yourself these questions? What hats are you wearing? What types of tasks do you need organized? Do you have tasks that are constantly falling through the cracks? What do you need to keep records of for future reference? Once you’ve identified your basic needs, then you can hunt for the tool that fits the best. Old school planners are those package deals you can purchase that have calendars and weekly planners already built in. There are some amazingly excellent options out there. Franklin Covey has been around for decades and offers amazing versatility in a pre-printed planner. People have been successfully planning with these for years. The Well-Planned Day is a beautiful homeschool planner that helps homeschool moms plan school and life in one convenient planner. I have a lot of friends that swear by their Erin Condren LifePlanners. These customizable organizers are as fun as they are functional. You can pick how you want your daily planner pages to look and what additional features you’d like in your personalized planner that’s printed and shipped to you. This style of planner has been around for years, and is still a viable option because it works so well for many people. They offer ample space for visualizing and organizing your tasks and time. You get tons of bonus features built in to the planner. Often there are additional features that you don’t need or never use that just take up space. The old school planner is an excellent option, and if you’ve been using a tool like this and it’s working for you, then don’t change it up! However, if these old school tools are just looking pretty collecting dust, then you might need to try an alternative option. With advances in technology and the population growing in smart phone usage, digital planners have been popping up all around. Of course, if you’re creative you can get Google calendar, docs, and sheets to work for you in a custom way. The best news about that is that it’s all free! However, most of us are looking for a tool to work for us, not a part-time job developing a tool! 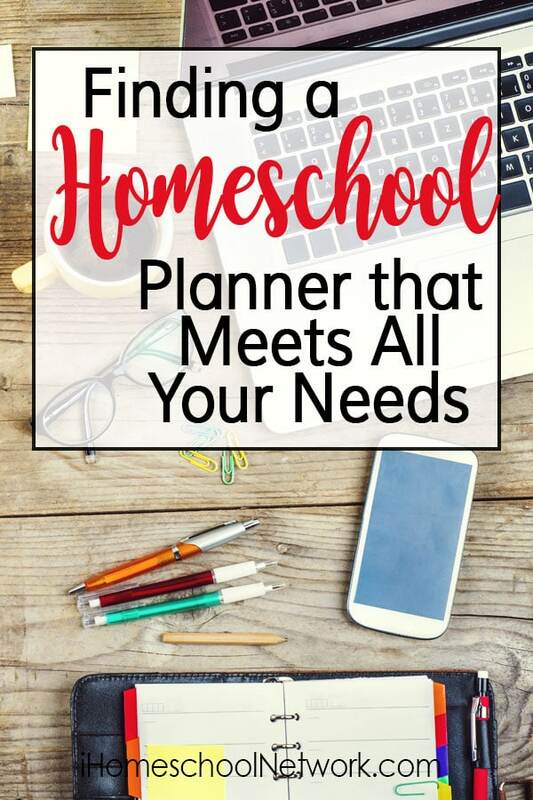 My favorite online planner is Homeschool Planet. With simple setup and recurring assignments, this tool can be a quick way to manage all of your life and share that info with your family. With online tools, you can create printable records from your work history. This is great for families who need to report their studies to the state. Accessible on the go from your smart phone. You’re paying for the technology and extra features – it’s a good price, but the most expensive option. Digital products lack the physical memory cues like a written task gives you the geography of a page memory cue. Online products are internet dependent to access. We get so accustomed to having WiFi, that it can really hurt when it’s not there. Then again, you can always lose one of the physical planners, so it’s possible to hurt either way! While I love digital options, I still enjoy a physical planner, so we’ll get to my favorite as an alternative to the old school and online options. Even though I’ve tried out the two options above, I have a thing about paper products that I just am enamored with. For the past three years, I’ve settled on planning my school, life, and work with a bullet journal. This has become my favorite tool for a couple of reasons. All of your thoughts about all of the aspects of your life are in one place. Since you can use any type of notebook, these can be very inexpensive tools. You can make it as fun and colorful or plain and simple as you like. Some designs out there on Pinterest are elaborate and time-consuming. Creating layouts can become a part-time job in itself if you’re not careful! Creating something from scratch can be overwhelming. The fear of doing it wrong can stop you in your tracks. For Christmas this year, my daughter who knows my love language is office supplies, got me an (affiliate link) Everlast Rocketbook notebook. This is the coolest thing! It’s a small spiraled journal that only works with (affiliate link) FriXion pens. You can write on a page, scan it through the app, and upload it to store it online. After you’ve imported it, you can erase the page with a wet paper towel and reuse the book all over again. There are so many fascinating options out there for organizing and planning your life. Find the planner that works best for you and feel confident that while there are exiting other options out there, the fact that yours fits your needs, and that’s all that really matters! Betsy Strauss is a wife to a deep thinker and a homeschooling mom of three kids. When she stumbled into homeschooling, she thought it would just look like public school at home. Thankfully, she quickly learned that using a one-room school house model of teaching was a great way to unify the family, and enrich family life without going crazy! She shares her encouragement on Family Style Schooling Blog.